In the years since, Anton has won over listeners and critics at high-profile jazz venues across the country, including the Blue Note in New York, Washington D.C.'s Blues Alley and the Monterey Jazz Festival. 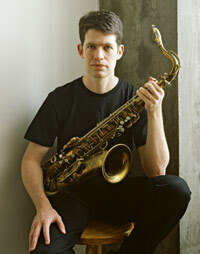 His frequent appearances at Yoshi's in Oakland draw sellout crowds; one such concert was broadcast nationwide on NPR's JazzSet with Dee Dee Bridgewater in December, 2005. Each of his four CDs has earned sterling reviews and strong airplay, with his most recent Radiant Blue landing Top Five on the national jazz radio charts. While his own writing earns consistently high praise, Anton remains as much at home with the great jazz standards as he is with his own compositions. Perhaps famed saxophonist Illinois Jacquet put things most succinctly when he told Anton, "You play the tenor sax like it's meant to be played."